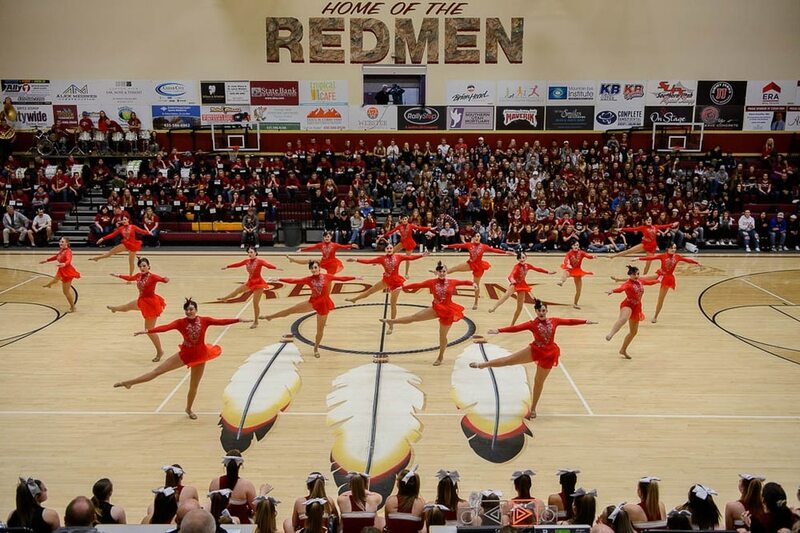 Is a ‘Redmen’ mascot racist or does it honor Native Americans? The debate is dividing a southern Utah town. (Trent Nelson | The Salt Lake Tribune) Cedar High School is considering a change in the name of its mascot, The Redmen, Fri... (Trent Nelson | The Salt Lake Tribune) Cedar High School is considering a change in the name of its mascot, The Redmen, Fri... (Trent Nelson | The Salt Lake Tribune) Cedar High School is considering a change in the name of its mascot, The Redmen, Fri... (Photo courtesy of Merrilee Ham) Merrilee Ham, second from left, celebrates with her family at a Cedar High School football g... (Photo courtesy of Marlee Kanosh) Cousins Jennilee Kanosh and Leia Shallenberger stand near a feather headdress in a trophy c... (Trent Nelson | The Salt Lake Tribune) A water tank above Cedar City with the Redmen mascot of Cedar High School. The schoo... (Trent Nelson | The Salt Lake Tribune) Cedar High School is considering a change in the name of its mascot, The Redmen, Fri... (Trent Nelson | The Salt Lake Tribune) Cedar High School is considering a change in the name of its mascot, The Redmen, Fri... (Photo courtesy of Merrilee Ham) Merrilee Ham poses for a portrait as a sophomore on the Lady Reds softball team in 1993 at C... The LDS temple stands over Cedar City as the sun sets on Thursday Jan. 10, 2019. 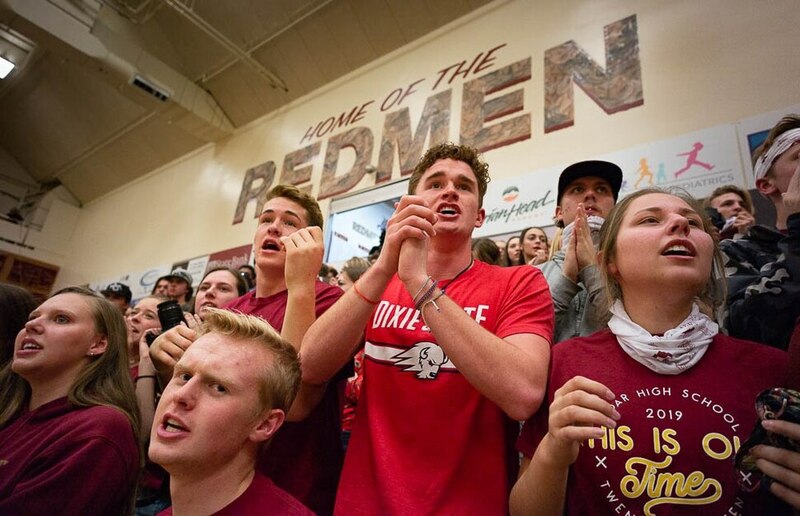 (Trent Nelson | The Salt Lake Tribune) Cedar High School is considering a change in the name of its mascot, The Redmen, Friday Jan. 11, 2019. Mohey Tawa, the Cedar High drill team, performs at halftime of a basketball game vs. Canyon View. 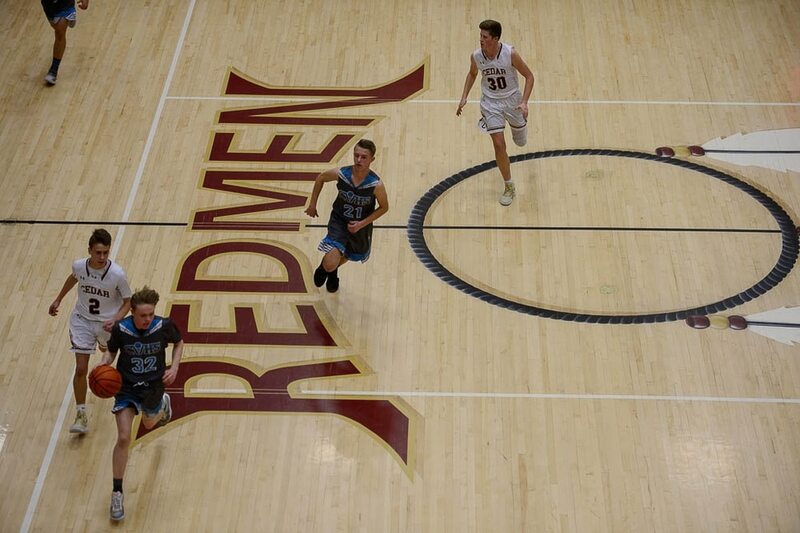 (Trent Nelson | The Salt Lake Tribune) Cedar High School is considering a change in the name of its mascot, The Redmen, Friday Jan. 11, 2019. Students in the gym cheer on their team during a close basketball game against Canyon View. (Trent Nelson | The Salt Lake Tribune) Cedar High School is considering a change in the name of its mascot, The Redmen, Friday Jan. 11, 2019. Cedar hosts Canyon View, JV high school basketball. (Photo courtesy of Merrilee Ham) Merrilee Ham, second from left, celebrates with her family at a Cedar High School football game in 2018 in Cedar City. Her son, Cason, plays football for CHS, where officials are considering dropping the school's controversial team name: The Redmen. Ham and her husband, Aric, hail from the Paiute and Navajo tribes, respectively. Ham said her siblings, cousins and children have been proud CHS athletes under the Redmen name, but others have decried the mascot as a racial slur. (Photo courtesy of Marlee Kanosh) Cousins Jennilee Kanosh and Leia Shallenberger stand near a feather headdress in a trophy case at Cedar High School in Cedar City. CHS officials are considering dropping the school's controversial team name: The Redmen. While Kanosh and Shallenberger are not CHS students or alumni, they are members of the local Paiute Indian Tribe of Utah and attended a public hearing on Dec. 18, 2018, to advocate changing the mascot. (Trent Nelson | The Salt Lake Tribune) A water tank above Cedar City with the Redmen mascot of Cedar High School. The school is considering a change in the name of its mascot, The Redmen, Friday Jan. 11, 2019. (Trent Nelson | The Salt Lake Tribune) Cedar High School is considering a change in the name of its mascot, The Redmen, Friday Jan. 11, 2019. (Trent Nelson | The Salt Lake Tribune) Cedar High School is considering a change in the name of its mascot, The Redmen, Friday Jan. 11, 2019. (Photo courtesy of Merrilee Ham) Merrilee Ham poses for a portrait as a sophomore on the Lady Reds softball team in 1993 at Cedar High School in Cedar City. CHS officials are considering dropping the school's controversial team name: The Redmen. Ham is a member of the Paiute Indian Tribe of Utah and said that she, her siblings, her cousins and her children all have been proud CHS athletes under the Redmen name. Others have decried the mascot as a racial slur. The LDS temple stands over Cedar City as the sun sets on Thursday Jan. 10, 2019. Cason Deschine started his freshman year at Cedar High School with a long family tradition of school spirit. His mother and uncles all played sports there. His older brother Braden was on the football team and once appeared at a basketball game in buckskin and a war bonnet — not his own Paiute regalia, but the costume of the school’s controversial mascot: The Redmen. Thalia Guerrero is dubious. She also is a member of the Paiute Indian Tribe of Utah and a senior at Cedar High, in Cedar City, where debates over the mascot have heated up over a series of hearings this winter. Even Guerrero’s teachers don’t seem to understand her objections, she said — not just to the name, which is regarded nationally as a racist slur, but also to the tomahawk chops, the face paint, the war whoops at school events. But for some Native Americans in and around Cedar City, the decision may not immediately heal all the wounds that have been opened. Multiple teenagers tearfully described how the dispute has laid bare the threats they feel to their identities and heritage. Teens and adults alike said the issue has revived sometimes painful experiences with trying to fit in: Oppose the mascot, and you’re seen as an outsider in the school and community, but support it and your Native authenticity is questioned. And there is frustration and worry from both sides that Cedar City’s entire Native American population will be seen as having the same opinion in a town where some Native students say they feel honored by the Redmen name, while others say they have been driven away from the school altogether by casual racism. “One comment I just couldn’t step over was, ‘All the Indians I know are fine with it,’” said Cheri Yazzie, a Navajo woman who graduated from Cedar High School in 1997. As a writer for the student newspaper, Yazzie wrote pieces objecting to the team name and said she faced intense backlash for it — not just from her classmates, but also from adults in town. But some Native American supporters of the team name also feel silenced, said Merrilee Ham, Deschine’s mother. Ham and her family have been proud CHS athletes for decades, playing under the Redmen name. None of them has expressed feeling excluded or that the team name has made athletics less meaningful, she said. Now, she said, she’s begun to “tiptoe around” the issue. Posting photos of her kids in their football uniforms has taken on new significance as opposition to the team name has become more vocal. For her son, who began studying important Paiute ceremonial traditions after two of the people who knew them best died last year, that is heartbreaking. Ham said she worries that the tribal representatives helping the district review the mascot have already decided to call for a change, and that the non-Native community will see the tribe’s official stance as having “more meaning and more power” than her opinion. The Paiute Tribal Council has issued a statement in support of the process the Iron County School District initiated this fall: A committee of 28 students, staff, alumni, community members and tribal representatives was appointed to review the name, a series of public hearings will conclude Monday, and the committee will make a recommendation to the school board later in January. But the tribal council hasn’t taken a position on the mascot itself, said council Chairwoman Tamra Borchardt-Slayton, though the resolution frames the potential change in positive language. As a member of the school district’s committee, Borchardt-Slayton said, she still is listening to input. More than 200 people have attended public hearings in the past month and another 180 have sent emails, Rich Nielsen, the school district’s director of secondary education, said in a December meeting, recorded by Color Country Politics. Native American and non-Native people alike have weighed in on both sides, Nielsen confirmed — and despite supporters’ claims that those objecting to the nickname are “outsiders,” the committee has received a number of complaints from locals. Unlike related controversies over the University of Utah Utes mascot, Redmen is not the name of a tribe or nation, but an explicitly racial description of skin color, Nielsen said. For a school that is 84 percent white to claim to celebrate a racial feature that is a target for discrimination is hypocritical, said Jennilee Kanosh, who was chosen to represent the Paiute Tribe at powwows nationwide as the tribe’s 2016 queen. “Parents have asked their kids not to be friends with me because of that, because of my skin,” she said tearfully at the Dec. 18 hearing, which she attended with a cousin, 14-year-old Leia Shallenberger. Several white speakers at the same meeting argued the name has been intended to honor Native Americans since the school chose it in the 1940s. “Who names their high school after somebody or something they want to mock?” 1983 alumnus David Benson said to cheers from the crowd. “Brigham Young taught that redmen are from an ancient and royal people,” agreed Alice Madison, referring to Mormon teachings that Native Americans are descended from a wealthy Jewish prophet who sailed to the Americas in 600 B.C. — though the narrative has no support in modern DNA evidence. “I’ve never seen a Redman mascot that wasn’t shown as a noble, proud, fearless warrior with his head in the sky and the full headdress on,” Palmer said. But when that is the image that the non-Native community reveres, it provides cover to ignore or marginalize living Indigenous people, said Marlee Kanosh, a Paiute member. For Guerrero, the warrior image behind the mascot shows nothing of the Paiute life she knows: learning to make bread, beading and hand games from her grandmother, hunting with relatives, throwing food in four directions “so we’re sharing with the Earth,” and attending ceremonies that celebrate humility and gratitude — not violence. At school, Guerrero said, white teachers and classmates have said they admire the mascot “because ‘Indians are warriors and they’re strong and independent’” — as if the brutalities of the past two centuries didn’t occur. However, the drill team faced sharp criticism when footage of a 2016 routine appeared on social media, showing members in black braided wigs, headdresses and face paint — all of which Paiute tribal leaders said they specifically warned the team against. The Tribal Council said it “expressed deep concern” when the drill team approached it with the idea and urged the team to work with the tribe’s cultural director and asked to preview the routine. "Unfortunately, the drill team did not follow up on any of the Tribal Council’s recommendations," read a news statement from the council. The drill team is not the only corner of student life where activities have strayed into Native American representations that have been widely denounced as appropriative or exploitative of stereotypes. A scroll through Instagram photos tagged at Cedar High School shows white students arrayed in mock war paint and feather headdresses. The predominantly white cheer squad can be seen during a 2017 summer camp in fringed tank mini dresses and headbands with feathers, hands to mouths in mid-whoop. Images of the cheer squad in their mini dresses circulated last year on social media, and team members reported receiving threats, said Borchardt-Slayton — exactly the type of event that necessitates evaluating the mascot through a “21st-century lens,” said Nielsen. Still other students and staff report they refuse to wear CHS apparel outside Cedar City lest they incur harassment or give offense, Nielsen said. Supporters of the mascot have often pointed to a sense of community and tradition they believe will be lost if the name is changed. Shallenberger balked at the complaint of lost tradition. Yazzie and Ham, from opposite sides of the mascot debate, and with very different memories of CHS — one as a criticized student journalist and the other an athlete — agreed that a person’s position on the team name depends a lot on their experience with exclusion. But Native students who oppose the mascot have to take on the rest of the community, Guerrero said. The district should recognize that students who are hurt by the name may be caught in a spiral that makes them more and more invisible, Yazzie said. CHS students have been “targeted” by their own classmates, Nielsen said. The committee decided not to include any current Native American students for fear they’d be harassed for their positions, Borchardt-Slayton said. Meanwhile, Yazzie said, the district itself risks continuing the cycle, from the very first lesson in which children learn Columbus “discovered” a place already filled with people. The mascot debate could have new implications for what happens in those classrooms, Borchardt-Slayton said. The schools also could step up their participation in tribal events, said Paiute member Patrick Charles. “If you want to learn about the Paiute Indians, where are you the second weekend of June of every year?” Charles said, referring to the annual celebration of the tribe’s 1980 restoration as a federally recognized sovereign government. As for the Cedar High mascot, the committee is not tasked with finding potential replacements — though it is receiving suggestions. Borchardt-Slayton said her favorite was offered by an alumnus at a hearing: The Reds, which already is used by girls’ teams at Cedar High and wouldn’t require the school’s “C-R” logos to be replaced. Charles made an even more inclusive recommendation.